Eva polish is an interesting brand I've only encountered at one Walgreens. I haven't seen it anywhere else. I did some research on it and I couldn't find anything. On the bottle it says it's made in Miami, FL so maybe it's some Florida thing? Kelly Green is well a kelly green creme. There isn't much more to describe with this one color wise. The formula of this was great. I just swatched this and it does dry on the matte side which top coat can fix or you can keep it mattified! I got this one because it reminded me of Essie's Pretty Edgy. I think this color is slightly lighter, but being a person who doesn't have luck with greens I found this a great alternative to the Essie $8 price tag. It's a great color and I'm actually liking this green on me! 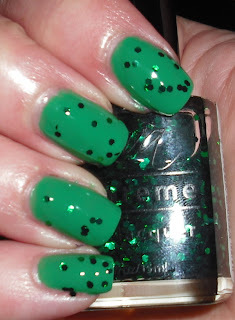 Green Glitter is green hexagonal glitter submerged in a clear base. It's an unusual layering polish that I definitely didn't have anything similar too. I really like having unusual glitters. I layered this one over the Eva Kelly Green and over a NYC Black Lace. I like this one especially over the black. I think it would make a great manicure. This would probably be neat to franken with too! That's it for today. This is just a fraction of my mega lacquer haul! I had a really great time with my parents. I wish they could of stayed longer. I don't miss home at all living in Florida, but I definitely miss my family. It was nice treat to be able to see them. Has anyone seen this Eva polish before? dude... i need these! those are awesome! Kelly Green is really pretty. I wish we had those around here. 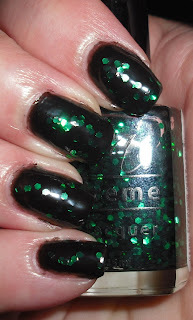 I also love the green glitter and since I recently found out that L'OREAL (bought Essie) does animal testing I will no longer be purchasing Essie polishes. I've never heard of that brand. I love that glitter! I've never seen any Eva polishes, but they look very pretty! I especially like Kelly Green, and I think it'd be a great alternative to Essie now that they do animal testing.